A terrible picture of my family en route to Arizona. Because who has time to take clear pictures with this going on? We had focused our planning energy coming up with ideas to keep our 4 year old occupied on the plane. We had bingo dabbers, stickers, Wiki Stix, and glitter pens. And Miles was amazed by all those things! He happily formed little cacti, drew lines around stickers, and made himself a beard from adhesive jewels. The problem was that, of course, my Felix didn’t calmly nurse to sleep like a newborn. He nursed for 8 seconds, popped off, and wanted in on the sticker action. As toddlers do, he managed to eat most of the stickers he snatched and definitely ate some Wiki Stix creations, which upset the sculptor and then everyone was crying. 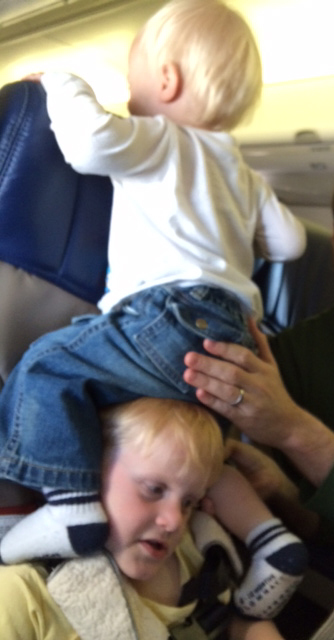 Halfway through the 4-hour flight, we introduced the Sky Mall catalogue to Miles and then he didn’t care so much if Felix climbed onto his head to talk with the people seated behind us. So for the second half of the flight, everyone was happy! Luckily, the kids were jet lagged for the return journey and I nursed Felix to sleep just as we took off. He stayed that way on my chest for over an hour, so I got to cuddle his dreamy, squishy body while Miles got to make art unimpeded. I snagged not one but two empty drink cups for Felix to play with when he woke up and…and!! !…I brought his favorite dump truck in my carry-on. As we landed, I nursed a happy Felix. And I tandem-nursed the dump truck because Felix became very insistent, and you do what you can to keep things calm when you’re a young family crammed into an airplane. Have you flown with mobile nurslings before? What were your best tips to keep the peace on board?